Hi. I decided to transfer some item qtys to “in use” status. I did this because the items were not physically on hand and I am waiting for a sales order to show up for them. I didn’t want the items to appear available. I didn’t realize that the “in use” qty affects the on hand quantity. I want the items to show on-hand, just not available. What do you the best practices for this situation should be? There might be other ways, but one quick way you could show quantities on hand but not available is to put them on a dummy sales invoice. (Or on an order and allocate it.) If you don’t already have one, create an internal customer called STOCK or IN USE or maybe your company name and use that and put it into a batch called something like DO NOT POST so that it’s not inadvertently posted. Wow, thank you so much for your fast response. I am so glad I found your blog. Yes, I thought of creating a dummy sales order. So I guess I will do that. So what do people use the IN USE type for? I am the inventory control admin. I hope the fact that I moved items to IN USE , and then used the same inventory account number that it was transferred from – I hope this doesn’t cause probs on the accounting side. I have a few more questions coming for ya. My goal is to move away from using spreadsheets to record missing inventory make qtys in GP more accurate. And thank you Janice. I like the idea of adding process hold. thank you. All those ‘other’ inventory buckets like In Use, Damaged, etc. are meant to be used when you want to track inventory quantities separately from what is on hand. For example, if you take an item out of inventory to use internally, you might move it to In Use, then move it back to On Hand once you’re done with it. Damaged might be items received back from customers that are being fixed, and once they are fixed they can be transferred back to On Hand. Of course some of this does not apply for all types of inventory and I find in real life most companies do not use the In Use, Damaged, Returned, etc., because they cause a lot of confusion for little benefit. However, there are definitely situations where these buckets can be useful if utilized properly. No way to tell if there are any accounting issues cause by what you did without actually looking at the individual transactions. Typically, if you debited an account and credited the same account for the same amount, there should be no issue as there is zero net change. Do you know in which GP table(s) I can find the information on the Inventory Available to Promise Inquiry screen? I like to pull “Free Forward” information per each item. Is this field a calculated field and if I would like to pull this information on SQL do I need to link different tables and do a calculation? Please advise. I am trying to set up GP, so I can type an item number on an invoice and the price automatically populates. Is the price data on the item maintenance table or unit price table? Any direction is appreciated. This will typically depend on how you have your pricing and customers set up in GP, as there are multiple options. This is the kind of thing I do not like answering without knowing anything about someone’s setup and needs, as it’s just as easy to set it up incorrectly and cause additional headaches and work. I would recommend getting some advice and training on this from your GP Partner who will hopefully be able to give you the best recommendations based on your specific situation. Also, do you have a list of BOM tables? I found the BOM tables above, but I can’t seem to find the table for the finished goods flag. I do not believe there is a “finished goods flag” – I think you calculate that from other tables, like SOP and/or BOM. This is what I am looking for. Is it not stored in a table somewhere? Your image did not come through…are you able to put it somewhere on the web with a link? Thanks, that worked. I am pretty certain that is calculated on the fly and not stored in any table. I believe if there is an entry for the item in BM00111, then it will be marked off as a Finished Good on the Item Maintenance Options window. I know I have used that logic for reporting before and it’s not been an issue. Thanks so much! Keep warm! I’m trying to find the table that has the Annual Historical Usage from the Item History window. is there a table i can access to view this information? On table IV30200, what’s the difference between IV_Trxent and XIV_Trxent? I am assuming that IV_Trxent is a system generated batch source on any assembly, or material issued to a manufacturing order. The XIV_Trxent has to be a manual adjustment. Typically an X in front of the bach source indicates that the transaction was posted without a batch. No other meaning. You can usually confirm this by looking at the bach number – if it’s a GP user ID, especially if it is lower case, that would be another indication of a transaction posted without a batch. Updating these in IV00101 should do it. I have done this many times with no issues. I always do data validation first to make sure the values are in IV40600, but it sounds like you are already doing that. Hi Victoria, I often google (bing!) GP table names and when your site appears, I always start there, and I usually find the answer and don’t have to go further. You have provided a huge service to the community by taking the time to document and share information. Many Many thanks from me. and I notice neither has U of M columns identifying how they are being received. Are items always received as Purchasing U Of M as identified on IV00101? If no, how can I identify which U Of M items are received? I believe these tables will always store quantities in the base unit of measure for each item. To see what U of M was actually on the purchase order or receipt you can check the POP tables. Hi Vic, Would you let me know at what time does the IV00102 record get created? My understanding is that a general – overall – record is created in IN00102 when an item is created. Subsequently, any time an item is assigned to a site an additional – site specific – record is created in IV00102. Is there a good way to find the date an item went out of Stock? I’m surprised it isn’t in the IV00102 table. I imagine I’ll have to do some type of calculation. Love the site. First time poster. Unfortunately GP does not keep track of this. Nor would it be easy to calculate. you need this on an ongoing basis, you might consider a SQL trigger on the IV00102 table. Thanks. I figured that might be the case. I have a trigger in place now that will tell me this but I was hoping to look at some history. I’m trying to get the last cost/last receipt from IV30300 where DOCTYPE = ‘4’ but this code don’t work. Can someone help. In order to do that you basically have to take 2 passes at the data. First, determine the latest date that DOCTYPE 4 exists for each item in IV30300, then get the data from IV30300 for each item/max date combination. Below is one way to do it. I left the columns unrestricted, with a select * because I wanted you to see all the data – it’s entirely possible that you have multiple receipts on the same date, so you may need to decide what to do in that circumstance if you’re only looking for one result per item. Thanks!!! you are also so helpful. However, in our installation (not sure if a customization was made – we do not think so though) – the Planner ID in the Item Resource Planning window is restricted to 3 characters. When we load more than 3 chars directly into the table for a record, the display truncates to 3 chars. The Planner master table IV00110 is the same – and Planner maintenance also allows only 3 char entry – HOWEVER – it shows all 15 chars in list. Is this standard behavior ? (we are GP 2010 V: 11.00.2044) Thank you for any guidance! I see the same thing in my GP 2016, so it seems to be standard. I would suspect that this field was panned for something else originally when the field was included in the tables and then when the user interface was created it was decided to limit the Planner ID to 3 characters. Alternately, it could be a bug. Thank you for the quick response! We use it extensively for our MRP / Planning to assign responsibility to Master Planners . That makes sense, I don’t usually work with MRP. If it’s important, it might be worth contacting Microsoft support about this, however, even if they determine it’s a bug they might not be too quick to fix it because it may not be a high priority. Another option if you are looking to store more information might be to use Extender. Hello, We are using the currency method of price levels and have one attributed to almost every one of our customers (we are a service company and pricing is dependent on system sizes so this is the best way we came up with to do it). I know how to enter quantity breaks in pricing, but we have a customer who sent us a PO for a certain amount for the first system and a second amount for each additional system. So if they have 1 system serviced, it is $95. If they have 2 systems, it is $95 plus $45. If they have three, $95 + $45 + $45. I cannot figure out how to do this in our current configuration. Is there a way to set this up? Thank you in advance. I can’t think of a way to set this up with GP’s pricing only. One option might be to create new items for the services depending on whether it’s the 1st service or not. So for example – FIRST SYSTEM SERVICE has regular pricing ($95), SECOND SYSTEM SERVICE or ADDITIONAL SYSTEM SERVICE has different pricing ($45 each). Something really strange happened today. I have a transaction that is in the GL but not in the inventory subledger. Its a PO receipt. How is this possible? It’s not in the inventory reconciliation but when I go to a form and lookup the PO it is there and shows received. That is very strange. Can you check to see if that PO number shows up in the POP10500 table? Hi Victoria – working with Scott on this….there receipts are indeed included in POP10500 table – have quantities received into the proper location in inventory in that table. Simply not part of any inventory inquiry. Any ideas? Also verified that the receipt is not part of the inventory tables IV30300 or IV10200. We are using these tables for custom queries and is how we noticed the problem. In the POP10500 table – get the POPRCTNM for the receipt. Look for that POPRCTNM in the POP30310 table. What is the value in the NONINVEN column? So this is a non-inventory item flag – troubling because items that we are receiving against a PO now have this flag. This is troubling. I often see this happen when the PO is created before the inventory item is created, so it may be a timing issue. Are your Purchase Orders entered manually into GP? If so, this may also be a training issue – when creating a PO for a non-inventory item the user gets a message asking them if they want to create the item, this should alert them that they are entering a non-inventory item. This is happening with manually entered POs and on occasion the item may be new but for the most part these are existing items that have been processed by the system correctly in the past. If I look in Item Maintenance the item type is listed as “Sales Inventory”. I’m not sure if this is the appropriate filed to be referencing in this situation. Additionally I want to point out as it may be relevant, that the debit to INV is going to the wrong GL acccount. In item set up I can see that it should be going to INV control but the debit ends up going to INV General. The GL account for a non-inventory item will be taken from the Vendor default Purchases account (or the company default posting Purchases account if the vendor one is blank). 99% of the time that will be different from the inventory account, so that makes sense if your items are not recognized as inventory items. I wonder if maybe what the users are entering for the item number on the PO’s is not identical to what is in the GP inventory module. In the past I have seen situations where there are special characters present – for example when something is copied from Excel sometimes the ‘carriage return’ is copied into the ID. This is impossible to see in the user interface when just looking at the items, you would have to do some testing. As a start – enter one of the items you are having a problem with onto a new Purchase Order. Don’t use a lookup, manually type it in. First, if GP does not recognize it as an inventory item, the Description field on the line should be blank. You can also go to the Purchasing Item Detail Entry window and at the bottom left will be a field for Item Type – what does that say? If it says Sales Inventory then this is not the case and something else is going on when the PO’s are being entered. Also, there is an option you can turn on that will give you a pop-up every time you enter a non-inventory item – on the Purchase Order Entry window under Options select Add Item – this is a toggle, you want it to have a check next to it. I believe this is a per user setting, it will be saved but only for the user you are logged into GP as. One final note – if this is an issue with a lot of items, you may want to get your GP Partner involved and have them look at what might be causing this and help you find ways to fix this for the future. And also help you find the best way to clean up the issues caused by the prior PO’s with this problem. A thought relating to this . . . I encourage people to enter the line item it the p.o. by doing a lookup and then selecting. That way if it is not listed, it is a flag. Either the item has not yet been entered or has not been assigned to the vendor. This seems to have eliminated the accidental entry of non-inventory items. I have a process question – that I am hoping you can help me with. We recently started using Great Plains to cycle count our inventory for specific sites/racks/bins/items/lots – we are using the Stock Count Schedule to do this along with Panatrack and Scan Guns. We have a consultant that is telling our Inventory Team that we should be using Available Quantity as the value we compare against rather than on hand quantity. I completely disagree with this approach and believe that you have to look at on hand quantity – that is the way that GP is set up and that is the way that Panatrack works with GP. My question for you is, is there validity to the approach of basing your cycle count on the Quantity Available data rather than the On Hand – my understanding is that you count on hand because that is quite literally what should be in the bin for that lot. Your process should be to freeze activity for that area of your inventory by not putting in any adjustments or physically receiving material into that location until you are done counting. What you have allocated should still be accounted for after you’ve processed your cycle count the same as it would have been before except in the case where it will cause a negative variance and in that case you need to research why you have less inventory than you have allocations for, those should have gone to a back order. Yes, in general I agree, you should be looking at Oh Hand, since that’s what should match what is in your inventory. The only reason to use Available Qty would be if what’s allocated is actually not on the shelf anymore. That is theoretically possible, so I would clarify with your consultant if this is what they are expecting and why they are recommending using Available Qty. What sql table(s) is/are the Item Extended Attributes link to? I am not familiar with a window by that name – is it possibly from a 3rd party product or customization? Or maybe an Extender window? I am trying to update many Reorder Points and Restock Levels at once (about 1500 items in 20 different sites). If it makes a difference, these are items that currently have a reorder point/restock level of 1, or 2, etc., but I need to change them all to 0. I was planning on using Integration Manager to do this but it doesn’t look like IM can make changes to the Item Quantity Master table, which I think is the only table where I can make these changes. I looked into using the Table Import function but I don’t know if that will work, either. Do you know of a way to do this? I have a list of all of the item numbers, so it’s a matter of changing the ORDRPNTQTY and ORDRUPTOLVL to zero for all 1500 items at all 20 sites…and I certainly don’t want to do it manually! I believe Table Import will only import, not update existing data. Unless you have customizations or add-ons using them, there should be no problem with changing these values directly in the SQL tables. That would be the most efficient and painless way to do it. If you are not 100% comfortable doing this, I would recommend getting some help with that either from your GP Partner and/or your IT department. You could do it with an update query. Import the item numbers you want to change into a separate new table then use an “in select” statement so that it only updates those item numbers. If possible update it in a test version of your company first to make sure it works as you want and doesn’t break anything first. Like Victoria Said if your not comfortable doing that though check with your GP partner or IT department. I know that but she said she had a list so i thought that route would be easier. I am not aware of any way to do this without some kind of customization. Can you tell me what tables make up the Item Resource Planning Maintenance window? I believe all the fields are in the IV00101 table. Might be something in IV00102, but I doubt it. Hi Jay, You probably already found what you need, but in case anyone else can benefit from this…Reorder Point (ORDRPNTQTY) and Restock Level (ORDRUPTOLVL) are on the Item Resource Planning Maintenance window but I just found those fields in IV00102. We recently added 117 new inventory items in Test for new invoicing system in CRM. I have verified these records in IV00101,2,5,6,7,and8. These were all entered by copying existing items so that gl accounts and other variables so did not need to be entered by hand. My question is can I pull these records into an update script to apply against Live db, after backup? Test is copy of Live with these records added and about 2 months out of date. These are GP 2015 instances. I would not recommend this without a huge amount of testing and data verification. In this case, I suspect the amount of testing and data verification you’re going to have to do to ensure this all goes properly would likely take more time than creating these 117 items manually. Just my 2 cents. I bow to your experience, knowledge, and wisdom. Just hoping to avoid going back to verify after staff finishes work. I did this myself in Test as I was writing new entities in CRM and stored procs for use in scribe. In Dynamics GP the On Hand Qty only changes once an invoice is posted. The Qty Available does change as soon as you fulfill an order. I’ve been trying to get what I thought would be a simple list of item numbers and serial numbers by receipt number put together. I started with SmartList Builder and then moved back to SQL to see if I can get the right table combination with no luck. So far, I’ve tried IV00200, IV10200, IV10201, and IV30400 and I can’t seem to figure out how to combine these properly to provide the desired result. I would appreciate if you could give me an idea of the best tables to use and how to link them. Are you talking about Purchasing Receipts? If so, I would recommend using the POP tables: POP30300, POP30310, POP30330. After two hours of no luck, I had the inventory clerk who made the request sit down with me to show me her data-entry steps. As soon as she said click on the Payables module the dots connected. A mental note was made to not make assumptions and adjust my procedure for any future changes! Good idea – always very important to speak to the people actually entering the data to determine where it will end up in the tables. I need to remove all the current vendor item numbers in the IV00103 table and replace them with a corrected vendor item numbers. Would i be able to just truncate that table and write an insert sql script with the corrected ones. There is no inventory issues as they do not stock anything it is all drop ship. If the data is already in the IV00103 table and you simply need to update one of the fields (vendor item number), I would recommend updating just that field. Deleting and repopulating the data requires a lot more effort and error checking, IMO. In that case, I am not 100% comfortable simply suggesting a fix in the tables without actually seeing the data and checking other related tables. Part of the issue is that a lot of the data will have to be validated if you simply import it into the table. Another part is that there are other tables that have data linked to the IV00103 table, IV00102 just to name one, but I believe there are others. In short I would not recommend simply fixing this data directly in SQL. Victoria, May one write a sql update query to modify the ORDERPOLICY and ORDRPNTQTY in the IV00102 Table? Yes, if you are using GP out of the box, you should be able to update these without a problem directly in SQL. Awesome! Thank you! Wasn’t sure if any other tables would be involved. Hi Victoria! Where I can find the flag that shows me if the item is STOCK or NON-STOCK. I was looking at IV40400, but nothing seems to give me a clue. By “non-stock” do you mean “non-inventory” using Dynamics GP terminology, or are you referring to something else? If yes, then you will not find “non-inventory” items anywhere in the inventory tables. You can see these on Sales and Purchasing transaction lines, though. For example tables SOP10200 and SOP30300 have a column called NONINVEN. This column will have a 0 for inventory items and a 1 for non-inventory items. If you mean something else, can you please give me some more detail? I was wondering in IV00301, what the RCRDSTTS choices are? My current record has a value of ‘1’. Was needing to know what that value means and other choices that may be available. I was needing to close that Lot. I see values of 0, 1 and 2 in the sample data for that field. Unfortunately I am not seeing any information on what those values mean anywhere, sorry. If you get the answer, please write back to let me know and I will post it on the blog for everyone to benefit from. 0 is for a new attribute record on an unposted (WORK) transaction (e.g. on an Inventory Increase Adjustment). Once posted the RCRDSTTS will change to 1. The RCRDSTTS will be 2, when an ad hoc lot number is used, perhaps on a transfer or decrease transaction. Hi Victoria, is there a way to track the inventory transfer entries in the IV tables to the root. In other words, if I have an entry with Document Type # 3 (Inventory transfer), can I know what type it was back at the source (was it also a transfer, sales invoice, adjustment, etc…)? The goal is to trace the transfers all the way to the root. Thank you! Not sure what you mean. An inventory transfer normally can only be initiated by an inventory transfer transaction. It would never come from a sale or an adjustment – those would be other Doc Types. It’s possible that you have some kind of customization or 3rd party product that causes other events to create inventory transfers. In that case, you would need to talk to the developer(s) of that to get the answer to your question. Thanks for the quick reply! Maybe I didn’t formulate my question clearly. So let’s say we have a Doc Type 3 entry showing that Item A was transferred from Tank 1 to Tank 2. Is there a way to see what the Doc Type of Item A was before the transfer (when it was in Tank 1) and get all the details? You mean the entry that ’caused’ you to have to make the transfer? I don’t think there would be a definitive way to track this, since the entries are not related in any way. So the generic answer is no. The longer answer is that you may be able to derive this by looking at your data specifically and making some assumptions and educated guesses. Coding that could be a challenge depending, again, on your data. Sorry not to have an easy answer. Is there anyway I can find out who created the item in Item Maintenance(IV00101) table ? We track BOM edits which usually reveals the creator for manufactured parts. A weekly report also lets everyone know about BOM changes. For purchased parts, maybe the buyer field would help determine the creator? Thanks for responding, I am trying to determine which way is more accurate to use in my SQL view. Should I use the field qtyonhnd in IV00102 that gets updated every time a transaction gets posted, or should I use the formula of qty received – qty sold from IV00300. Since this us for a report running a reconcile for every item we suspect may be off is not a viable solution to having inacurate data in the report. I need to make a decision of which way of displaying the quantity in hand for an item is most likely to be accurate every time the report is refreshed when the user opens it to check inventory levels. Thank you again for your assistance, your site and books have been an invaluable GP resource! I would think using QTYRECVD – QTYSOLD in IV10200. That’s going to be ‘more’ correct than the Quantity on Hand in IV00102 is something goes wrong during posting. I am trying to build a Bin Lot Inventory Quantity report, and I need some help understanding the difference between the QTYONHND value in IV00102 and the Calculation for IV00300.QTYRECVD – IV00300.QTYSOLD = QTYONHAND I would have thought that these 2 amounts should have been the same, but they are not. Could you explain where and how the IV00102 Qtyonhand value is calculated? Quantity on Hand is not technically ‘calculated’. It’s a field that is updated every single time a transaction is posted that causes a changes the quantity you have in stock of an item. It’s entirely possible that some of these are not correct for various reasons like posting interruptions, incorrect data manipulation, etc. If you suspect a particular item is not right, you can try running Inventory Reconcile for that item to see if anything changes. Victoria is correct (as usual)! You can also try looking at IV10200 table for QTYRECVD – QTYSOLD. It seems also that GP is very prone to (transaction) “disruptions”…that why the Inventory Reconcile routine was created. Hello Victoria, thanks for your tireless efforts keeping all of us on point with GP and its best practices. I have an end-user request to “Remove the code that deletes the component from inventory (IV00200) table.” I would like to know what are the ramification of taking such a drastic step. Thank you! Sorry, I am not sure what this means…how would you “remove” this code? Through customizations we have been able to mirror the Kit process in GP. As you know, with the Kits there is no serialization, however the components of a kit is serialized. Well…through modifications we have been able to serialized both the kit and the components via a process call Pack. When the Pack is returned to us, it is causing duplications because both the Pack and the components of the pack are updating in Inventory. So, to modify the inventory process further a request to modify the code so that inventory is not updated has been submitted. I don’t know if it’s possible to solve this in blog comments. I would recommend sitting down with your GP Partner or whoever is creating these modifications for you and walking through your needs and what is possible in GP in detail. If it were me, as a start, I would recommend not using kits, but using the “light” bill of materials process that comes with the Inventory module to assemble your finished products. That might avoid all of the issues you’ve mentioned and not require any modifications/customizations. We are using GP 10 (still 🙂 ) and I need to ‘duplicate’ all items in IV00103 vendor item table with a new vendor . We have over 3000 SKUs so the process is daunting. If I create a file containing the new item/vendor combo) can I use a SQL insert to get records into the table, or are there other table associated that I need to worry about? Your website has helped me out of lots of jams over the 6 years we have been using GP . It is an invaluable resource! I have not done this myself, so I am not 100% certain it will work. You could try it with one item and test using the item/vendor combination in GP to see how it goes…or post a question on the Dynamics GP forum to see if anyone has done this in the past. Hi Victoria, thank you for so much valuable info in this blog! Do you suggest I update directly from SQL? Or is there a way to get IM to update instead of insert? Since this field is in a master record only and does not need to be validated, I don’t see any reason you cannot update it directly in SQL. I have done this before with no problems. I also updated it directly in SQL. I didn’t use integration manager or anything for that. It actually is smoother doing it direct. Thank you Victoria for your quick response! I ran the update script for my first vendors. I worked perfect! However, I then ran a second script for my other group of vendors but that froze GP… Now now of my users can access GP. Help! Updating data, whether in SQL or Integration Manager should not be done when users are in the system, nor should it be done without a backup. That’s general best practices and should be followed for any future updates. At this point I would try to force quit the SQL update and see if that fixes the GP access issue. If not, you will likely need to call Microsoft support or your GP partner for immediate help. I had not committed the update and I guess this caused the hiccup. My systems are running smoothly again. I know you get this a lot, but your are awesome!!! What update script are you running? Is it with Great Plains or is it something that you wrote? Can you tell me what you mean by your second set of vendors? Steven, If this is a new integration you just built, it defaults to “Insert Only”. You need to change the Properties>Destination Edit Mode to “Update Only” or “Insert and Update”. Thank you David for tip! We currently change the item type to discontinued for discontinued items, as expected. What we thought would be that it would only allow sales documents to use the quantity on hand, but it does not prompt the user in any way that the item is discontinued. They can order any quantity that turns into a back order. Inactivating the item prevents them from putting it on a sales transaction completely, discontinuing the item but allow sales of discontinued items results in backorders. I see you’ve got this message on a number of forums already, the only other advice I can think of in case you have not tried this yet is to uncheck the Allow Back Orders option on the Item Maintenance Options window for your Discontinued Items. Hi Victoria, by the way I love your table fields index. I am doing a new stock count schedule using the Mass Add. I have noticed that not all items were selected from the Mass Add using the filter by Site ID. Is there a field somewhere that indicates that this item should be included in future count ? Digging a bit through these items I think it’s because there were no purchase but only variances transactions. It might also be because these items were initially imported at the beggining of the GP deployment. If none of those are the case, you might need to ask your GP Partner or Dynamics GP Support for help on this so they can look at your data together with you. We had most of our inventory duplicated last week in another location in error (don’t know what caused that to happen)! Luckily only 4 items were used in transactions before I was able to delete the location from each item. Most of them I did with a DELETE in table IV00102, because there were thousands of items. For the 4 items that had inventory adjustment transactions posted, I used the Remove Transaction utility first. Now, however, for these 4 items, inquiring in Item Transaction Inquiry or Item Stock Inquiry causes GP to hang. I’ve tested removing records in these tables IV30100, IV10200, IV10201 AND IV30500, IV30300, I’ve run Check Links on all of the Inventory tables and reconciled Inventory but it still hangs in the inquiry screens. , The (wrong) location doesn’t show up in Item Quantities Maintenance for these 4 items. As to what could have caused it – it’s pretty easy to go into the Site Maintenance window and assign all items to a site, takes just a few clicks. You might want to make sure most people do not have access to that window. As to how to fix the issue you’re having – unfortunately, removing data directly from tables and removing history can have some very unpredictable results. It’s really impossible to tell you what to do without a lot of additional analysis of your system and data. I would recommend starting a case with Dynamics GP support – they will likely have you do a bunch of logging to determine what exactly is going on when GP hangs to help resolve this. Thanks for the reply, Victoria. We’ll look into your suggestions. Chris, not quite sure what you mean…usually everything in GP has an ID. Can you please clarify? Also, are you using standard pricing or extended pricing? Hello, where does the SOP10200.UOFM comes from which IV table? The UofM here is what the user types in on the Sales Transaction Entry window. As per my understanding or at least in our system it comes from IV00108. However, It can be a result of our customization because we never type UofM in Sales Transaction Entry window. Thanks so much for the quick reply. I recreated a transaction in the test environment and did see that the serial number will be placed back once document is posted. When you enter the return, if you put the quantity back to On Hand, the serial number should automatically be available again once the return is posted. Is that not happening? First, thanks for all the information here. Your site has been immeasurably helpful. I’m currently assembling a view for my organization so they can see the price list, which I would like to include price level description. I could not find that anywhere on the commonly used tables above. I found the data to be located at table IV40800, and I thought I’d share it here in case any other users run into the same problem I did or if you would like to include it in the list at the top of the page. I need to update quantity on hand with over thousand items to GP db. Do you have any suggestion to do this with easiest/fastest way? I can use the sql query to update IV00102 table but heard that is not a recommended way. please let me know your thoughts. Updating the IV00102 table is absolutely not recommended and will cause you data issues. The best way to do this is to import an inventory transaction using something like Integration Manager. I installed the Integration Manager already, but I could not find quantity on hand field to match it when select the Destination from the IM tool in GP. please let me know which adapters and/or destinations I need to pick for this. You want the Inventory Transaction destination. Basically, you will be importing a transaction to bring the inventory level to what it should be. So, if it’s currently 5 and should be 7, you will import a qty of 2. If the current quantity in GP is 10 and should be 7, you will import a qty of -3. For increases you will also need the correct prices for each item. Can you tell me which table holds Internet information for an Item? In the inventory Maintenance window the second field is for the description – at the end of the field there is a button that expands a window for internet information and user defined fields. Need help finding that info. All internet information (for items, customers, vendors and company records) is stored in the SY01200 table. Just discovered your site; a GP newbie’s wish come true:) I am looking for a book or resource that can get me started from the ground floor with GP’s eConnect API’s. Everything I’ve come across on the net thus far has been bits and pieces meant for people already familiar with this technology. Any help on locating a resource would be greatly appreciated. Unfortunately, I don’t know if anything like that exists. 😦 I will post back if come across anything. First post on your blog. Thanks a lot for sharing your incredible experience. I actually need to fine-tune my SQL view to display the complete price list, to be able to import it into another software. We use 3 currencies (CAD, USD, EURO) and many UOM. I would like to only have 1 line per item. Currencies and UOM should be available by rows. It’s not really a problem for currencies, But what is the solution for UOM ? My following SQL view is working for currencies, but each Unit of Mesure is reported to another line. Maybe adding a condition which add a postfix to the item if the UOM is different than “one”, as “-x” (-5, -ft, -m for example) should be the solution ? How I can do that ? But, I cannot use “EACH” as AND condition, because I can’t list of Unit of Mesure for each product. But I would like to obtain currencies by columns instead of rows. So with the following example, I should obtain 2 rows (instead of 8) and and 8 columns (instead of 6). –###?? Price U$ — ?? You are the best ! Exactly what I expected. Working perfectly. Thanks very very much. Last thing for you : I need to add another item description (other langage), which is located to the SY01200 table, field INETINFO. Seems to be very clear, but can you suggest me a solution to complete my view ? The 500 is just a suggestion, you can make that bigger or smaller, as needed. Use that in both your select statement and the group by. Please let me know if that does the trick. It was the solution. I now just finished my view which work perfectly. It was not be possible without your precious help. A big thanks to you. The only way I know of to ensure a specific cost layer goes on a particular sales invoice or order is to use serial numbers or lot tracking on the items. It’s a bit of a pain to switch to if you have the item on a lot of open transactions, but it works beautifully – we do this in our production GP environment for things like maintenance renewals, which are the same item, but a different cost and price each time. Thanks for the quick reply. I agree that works well as I use lot tracking for a similar case where I’m selling the same item for multiple costs. However, in this case, I very rarely will sell the items for a cost other than current cost. I will have to test further to see if I can automate or bypass the tasks that go along with have items lot controlled like assigning the lot at receipt and fulfilling orders. We are trying to change the inventory document number of unposted transactions via sql, since there was quite a volume of transactions that were encoded with an incorrect document number. Aside from IV10000 and IV10001, are there any other tables to update? And what could be the effect of this change in document number after posting? Thank you. There could be another dozen tables that you would need to update, it all depends on what features of GP you’re using and the specific detail of your transactions. After posting, there would be many more tables involved. I would hesitate simply giving you a list of tables, as I would want to look at the data itself before giving advice like this. If possible, you might be better off deleting the transactions and importing or re-entering them. If this absolutely has to be done in SQL, I recommend that you work with your GP Partner and/or Microsoft Dynamics GP Support to help you with the changes. That way they can look at your data and confirm what needs to be done. Is there a very simple way to do that ? Sorry, what are you looking to add this to? all the precious informations there is unvaluable. Do you know if there is a stored procedure to call or something else to do to force GP to reapply the Item class ‘template’ on items? I am not aware of any ‘automatic’ way to do this from SQL. You could try to run a SQL profile to see everything that’s called when you roll down settings from a Class, but it’s possible there is not just one stored procedure to call. And you would really have to try changing every single setting to make sure you’re seeing everything. Most of the settings that can be changed from the class after an item is already in place should be changing values in the IV00101 table. Depending on what exactly you’re looking to do, it might not be so bad to write individual update scripts in SQL for each field. However, I would be EXTREMELY careful about validating data, testing, and making sure you’re not changing anything the GP user interface would not allow you to do, as you could cause some serious damage to your data this way. I will retry to run the profiler with every possible options combination to find out what is really happening. I am not aware of anything that would easily allow this to happen. And even thinking about customizing it, I suspect that would be a lot of effort, as there are so many places the items can be seen in GP. There may be ways of setting the items up without pricing, or not assigned to warehouses, so they cannot easily be put on transactions, but that would need to be thought through with full knowledge of your workflow, user permissions and GP setup…so something you may want to discuss with your GP partner and test in your environment. Hi Victoria – I’ve been a fan of your blog for as long as we’ve been on GP (since 2010). I can definitely say you’ve saved me many hours of heartache and growing pains with GP over the years, so thank you for your efforts! There may be others but these are all the ones that currently exist in our system. Since I don’t have a page for the SVC tables, I will leave this in the comment here. They are all searchable, so someone looking for this table should find this info. A client of ours has extra pieces of info for their inventory items that normally we would put in the user defined fields, however the data is too long for the UDF’s. Even longer than short name. Do you have a suggestions of how to handle the extra data? Extender is a good solution for something like this. I recently found out that extender does not use a regular table structure but rather stores fields in rows, so this is something to note before jumping on board as I imagine its complicated to report on. Not having used the product I’m not very familiar and if anything has changed please correct me but figured I would put that information out there. Sounded weird to me when I heard that. I have created a lot of reports based on Extender data. While it is definitely a bit more challenging than simply having all your related data in one table, it’s really not something I would consider a deal breaker. Once you get used to it, it’s pretty logical and should not present any problems. Extender also gives you the ability to automatically create views for the Extender data, so that can help with the reporting quite a bit. Even if you do not end up using those views, you can see where the data is easily from them. I have a need to add 5 new price levels for 1200+ items. Is it possible edit the price list’s in XLS and insert the data? This would save days of man hours (up front) but will it have costs down the line? Any insight is very appreciated. You will also need to insert corresponding records into IV00107. I have similar imports directly into SQL before, but I usually do a lot of data validation ahead of time to make sure that the data I am importing is clean. I would recommend inserting one record this way and then trying to use it on a transaction to make sure there are no issues. The iv00107 fixed another issue I hadn’t had a chance to look at. This will save us a ton of time. Still need User Approval testing. 🙂 Well, I don’t give out credit card info…but I’ll send you the code for free. I’m going to attempt it. Will you review when finished? Have you ever done a view that ages inventory (say in 6-month buckets) on hand? This is a requirement in my org. for making “provisions for obsolescence”. We have a complicated issue w/ item names, and I was hoping if you could please help. We have several companies set in GP 2013, w/ each company having its own inventory databases of course. However, we are using two item numbers/names for the same part across two companies. Is there a way for us to change the those in one of the companies to match the other? We want to be able to do inter-company transactions, but have to enter each order manually when orders need to go between companies. The only thing that is common between them is the item descriptions, but I don’t know if that would help. There are thousands of items, and I’d like to find a way to do a batch update of one of the companies items to match the other. You can use the Item Modifier in the PSTL (Professional Services Tools Library) for this. It will take an imported list of item numbers to change. However, you would have to come up with that list on your own. This should certainly be possible with some SQL coding if you can link on the item descriptions. I would recommend talking to your Dynamics GP Partner, they should be able to help with this. Thank you so much Victoria. I’ll look into this, and yes I should be able to get further help from our partner. I created a new company and was able to upload my inventory items using IM. Now we would like to re classify the items and also I would like to delete around 50% of uploaded items as a result of reclassification of items. Can I just delete the records in IV00101 table and re-upload the new set of items? These items don’t have transactions yet. Also, I am using GP 2013. I have not done this before directly in SQL, but I think you would need to check a lot of additional tables – when an item gets created it populated a number of setup tables, depending on the item details. I would check all the tables starting with IV00. Also, if you end up doing this in SQL, you should run Check Links on the Inventory series after deleting the items. You posts have been very useful to me at many times. Is there any way to auto-create item number in GP? Waiting for your valuable response. There is no way to do this out-of-the-box in Dynamics GP. Hi Victoria! Is there any way to sort the available serial numbers in the Item Transfer Serial Number Entry screen? Unless the screen already offers sort options, to change the default sorting on any window would require a modification/customization. In Item Maintenance window -> Item Notes, do you know how many characters it can hold? Do you mean the note next to the Item Number? That is a text type field in SQL and can hold a LOT of data: http://msdn.microsoft.com/en-us/library/ms187993(v=sql.110).aspx. I am fairly new to GP and your blog has been a wonderful resource! I searched and read through the blog about Kits and can’t seem to find any information on Item Kit Maintenance Window particularly on Quantity distribution. My company is using Kit as an identifier via reports for what component items are combined. But the Sales Order are processed as non-kit defaulted items each with a percentage of sale. Example, Sales Order 1234 with 3 items at 40% in Quantity and Sales Order 1235 with same 3 items at 60% in Quantity. Using the Kit Item number with those 3 component items to identify them in reports as Kits. The problem is, now we have a transaction that combines 12 items and more which make this process and reports very tedious. Is the Quantity in Item Kit Maintenance being stored in SQL? Because I can’t seem to track them down. Without knowing where they are stored I was thinking to create Kits with the percentage allocated as its name then process the Sales Order as a package of those components. Reports will then use the Kits percentage name as identifier of how much percentages of sale. Do you have a better solution to this via using the default Kit without customization? The kit quantities are stored in the IV00104 table. Hope that helps. If not, please give me a more detailed example of what you’re looking to do and I will try to help further. Items 001,004,006,007,011,012,013,014,019,020,031,032 need to be combined and sell for 25%,25% and 50% to different Customers. I made the above items in inventory individually and posted under the purchase transactions entry. Then I made a Combined Kit that included the above component items at 100 Quantity each. Started a Sales Order Transaction Entry with the Combined Kit but it only allows me to input the Quantity of 1 and not 0.25. If I use a component item individually instead of a Kit then it allows me to put Quantity to 2 decimal places. What we have been doing is to create 3 Sales Orders that include all the items above at 0.25, 0.25, 0.50 Quantity respectively. In reporting services, however, these 3 Sales Orders need to be identified as a combined package sale. So we used the Combined Kit inventory ITEMNMBR as an identifier inside our reports for that purpose. Created 3 Sales Order Transaction Entries with Kit1-25 and Quantity of 1, Kit2-25 and Quantity of 1, Kit3-50 and Quantity of 1. I haven’t adjusted the reports yet and will like to confirm if this method will work? Thanks for the additional detail. I guess the part that I am still missing is what specifically you need to show on your report that’s making it so difficult. From what you’ve described, you should be able to report on this in whatever detail you need. can you classify the document types in Inventory transaction table IV30300 ? i m in need of your feed back..
That’s already here, under Inventory Transaction Document Types. On the SmartList search window you can change the Search Type (bottom right) to ‘Match 1 or More’ – that will let you do an OR search. Hope that helps. Thanks for your reply. I have the smartlist set that way. What I am trying to do is pull ONLY the parts that contain both, not either or. Thanks. Thanks for the clarification, sorry I misunderstood your question originally. I don’t see how you could do this in SmartList. Is your SmartList based on a SQL view? If so, it would be very easy to do this in SQL. If you need this to be a repeatable search, (ie, enter 2 different components, return the part that contains both) then you may need to go to a different reporting tool, one that will allow you to enter parameters, which SmartList does not. The 3 reporting tools I typically see used are Crystal, SSRS, and Excel.
. I am not that great with SQL. will see what I can do in Excel. I cannot see how this would be possible without a HUGE customization. Those item types control all the behavior of the inventory items throughout GP and there is no mechanism or support that I am aware of for adding additional item types. That’s stored in the IV00101 table. I believe the sales account index is IVSLSIDX. I’m trying to do stock adjustments via Integration Manager tool and I guess it’s not working ! I ran the tool and I found no transaction ! I went to the batch details and I found just the transaction header with Quantity = 0 and without items (details). also I checked the underlying tables and I found no details ! Please if you can help me out and tell me how exactly I can do such transaction via Integration manager tool. It’s very difficult to troubleshoot something like this without seeing it. I would recommend you get my book – it goes through an example of setting up an inventory transaction import using Integration Manager. I have not done this directly in SQL before, so I would hesitate to recommend it without some serious testing. I would recommend posting your question on the Dynamics GP Community Forum to see if someone has done what you’re suggesting before. Shipment is posted with wrong Lot Numbers and allocated to Sales Order. I need to change Lot Number. I search for any eConnect procedure available to update but I couldn’t found any. Is there any other tables also needs to be updated? If you received this in POP, I would also update the POP30330 table. You might also consider doing a search for all tables that have either SERLTNUM or LOTNUMBR columns to make sure you’re not missing any tables. You can use the code here to find all the tables: https://victoriayudin.com/2010/04/23/how-to-find-all-sql-tables-with-a-column-name/. Yes, its received in POP and POP30330 (Serial / Lot History) also included in my list. Once again thanks for your useful link to find a particular column in database. As this Lot number received first time in the system and its unique, I did search of all tables which contains this lot number through search-all-tables-for-a-string query which shows list of tables and came to conclusion that tables selected to update is as specified in my first comment. I am trying to make some old inventory sites inactive. However, I cannot find the flag for active/inactive on the IV40700 table (which is the Site Maintenance). Can you point me in the right direction? What am I missing? What version of GP are you using? The ability to make inventory sites inactive was only added in GP 2013. I am trying to create a smartlist using smartlist builder that would show the expiration date of all raw material lots for both historical and current inventory. The problem I am having is that when I use the Item Lot # Master table (IV00300) it only shows lot numbers that currently have inventory values and not items that have been completely used/sold. Is there another table that would show the lot number expiration date for both used/sold and current inventory? Try the IV30400 table – that stores the Serial and Lot Number History. I have tried using the IV30400 table, the problem with that table is that it ends up displaying the expiration date and lot attributes for every inventory transaction for that lot number, which can create anywhere from several to hundreds of additional lines per lot in the smartlist depending on how many inventory adjustments or manufacturing orders the lot was used in. For example, if lot ABC has been used in transactions 1, 2, 3 and 4 I do not want 4 lines in my data but rather just a header line with the lot attributes and expiration date for lot ABC. In addition, if the lot is in current inventory and has not yet been had an inventory transaction it does not show up in the smartlist if you use IV30400. I am trying to create a single smartlist that will show one line of information related to the expiration date and lot attributes for all lots (current and used/sold), like the IV00300 does for current inventory. Do you know if this is possible? If so, could you point me in the right direction? How about using IV00301 and IV30600? Those tables should have one line per item per lot number. I would recommend creating a view first, where you union the data from the 2 tables, then creating the SmartList. Thank you for all your assistance once again. I have a small problem, in Dynamics GP 2010-Inventory Transaction Inquiry Window, there is a field called Adjustment Reference, unfortunately I am not able to locate this field in any Inventory Table and the help section for that window does not even make mention of that field. I am hoping that you would be able to point me in the right direction. On my GP 2010 I do not have a field called Adjustment Reference on the Inventory Transaction Inquiry window. So you are possibly using a modified or 3rd party window for this and would need to check with the developer or documentation for that to determine where that is stored. Thank you Victoria, I will be making that contact right away. Is there any other table where items are tied to primary vendors? Can an item have both “0” no ventor? and “1,2” primary and non primary vendors? I checked a number of different datasets and I am not seeing any where the ITMVNDTY is zero. Sounds like a possible data issue to me, but without actually looking at it and knowing the history of how it got in there, it’s impossible to say. With the database I inherited I don’t know how or when data was externally modified. I have 70 item numbers with “0” as the itmvndty. That makes it fun to write reports, trust me. I’ve run reconcile and check links are there any other tools available to clean up the mess I have behind the curtain? Unfortunately, no. If it is causing a problem and you can confirm that it is wrong, maybe the proper course of action would be to fix this in the database, but I would hesitate recommending this without any additional information. If it’s causing you grief, it may be worth a call to GP Support to see what they recommend. Thank you for the wonderful info! Where is the “Default Site ID” on the “Item Transfer Entry” stored? I looked in IV10000 but didn’t see it. Thanks again! I looked all over, but am also not seeing where that is stored. Sorry to not be able to help. Maybe you can post this question on the Dynamics GP Community Forum to see if someone else can help with this. I am trying to create a table relationship between the ‘Purchase Order Work’ table and the ‘IV_Item_ENG’ (IVR10015) table, but i cant seem to figure out exactly what is wrong. when I bring up the table relationships window from the GP side, i cant see any of the MFG tables. is this normal? do you know if it is even possible to create relationships between tables in GP MFG module? please advise! First time poster and an altogether new member of the GP community (4 months now) and have found your blog to be extremely helpful. I’m trying to pull the bin of each item in a unposted sales order but after looking through all of the tables that I thought could be relevant (SOP10200, IV10001) I haven’t found any bin information. Would you happen to know where this info is stored? I don’t really use bins too much, so I do not have any good data to test this with, but have you looked at table SOP10203? If that does not help, you can use the code in this blog post to help find any tables that have either ‘BIN’ or ‘BINNMBR’ in the column names and go through them to see if any look promising. For ‘BIN’ you will find a lot, so i would start with the SOP and IV ones. I just tested it in both Google Chrome and IE 9 and it seems to be working for me. Can you let me know what browser you are using? Thanks for your reply. I am using IE9. Originally I was thinking that it is my machine but then I was able to post the comments on you resources page. Did you receive my question about deleting some items from a price level directly from IV00108? Do you mean Currency Setup? I am not seeing anything called “Currency format” – if you are, can you explain exactly how you are getting to it? 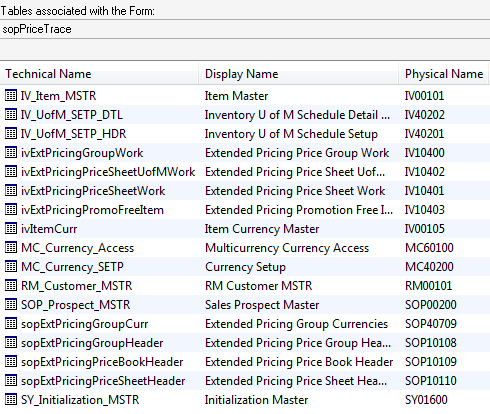 If you do mean Currency Setup, that is in the DYNAMICS database in table MC40200. when we click Function currency under Multi Currency Setup window. i need to find how many decimal places is setup. Yes, your screenshot shows the Currency Setup window. The number of decimal places is stored in the DECPLCUR field of the MC40200 table. You will need to subtract 1 from the value in the table. So if you have a currency with 2 decimal places, the value in DECPLCUR for it will be 3. Thanks for your quick reply…..
Long time reader, first time poster here. I can’t seem to find a good answer to this question. I would like to find a way to report on items on a sales order or invoice where the primary vendor was not used. We want to track second sourcing to find out how often an item is sold and the primary vendor is not used. Looks like the value I need is ITMVNDTY from IV00103, but this information is not held in any of the SOP tables at the line item level. Any suggestions? As a first step, you would need to tie the inventory receipts to the sales. That should be possible with tables IV10200 and IV10201. Once you’ve got that, you can link to the receipts to see what vendor was used and compare that to the primary vendor for each item. Hope that helps. I am trying to find out some more information about items that are classified as “Kits”. My company makes use of kits and when these kits appear on an invoice we see the kit line item and also the line items that make up the kit. What we are running into however, is that the actual Kit line item carries the Cost and Price but the line items that make up the kit only carry the Cost and no Price. So when we look at the margin on these line items they show up as a pure loss because they do not carry a price with them. I know that we can identify the Kit from the ITEMCODE. Is there any way to identify the items that are part of the kit? The reason is that we would like to remove the cost from those items that are part of the kit. Or attach the price to the kit items. Not sure how to deal with this. Thank you! Just to clarify – a kit is like having a combo sale. For example, let’s say you have 3 items in stock and you say to customers, “If you buy all 3 of these together, the price is going to be $400, but buying them individually, it would be $500.” In GP a kit is not a real item, it’s not like you ‘make’ a new item out of the 3 items in the kits, it is more like you’re selling them together at a group discount. Since your cost on the items does not change, the cost of the kit is whatever you paid for the 3 items. So the way this is recorded in GP is that the price is on the kit, but the cost is coming from the component items making up the kit. The issue you’re describing sounds like pure reporting problem to me, which I think you have also identified. You’re showing the price correctly – only on the kits, but you’re showing the cost twice – on the kits and on the component items. If all you want is the correct margin, you need to exclude the component items that were sold as part of a kit from your reporting. To be able to help with that, I would need to know what report(s) you are looking at. It’s possible that you either need to change/customize your current report or use other reports for this. You’re exactly right. It does have to do with the reporting side. The reporting we are doing here is actually in a homegrown reporting tool. We import the line items from GP every night from the SOP30200/SOP30300 tables into another SQL database. I would like to identify the component items that were sold as a kit but I don’t know what the identifier is. On a single invoice, I see the kit and I see several items which I suppose may or may not be part of the kit. I think they could include additional items on an invoice outside of the kit and it’s component items. Is there a field in GP that would identify those component items? Any line in the SOP30300 table where the CMPNTSEQ field is not 0 is a kit component. Hopefully you can filter your data to remove the cost from those. this was VERY helpful – I couldn’t find some inventory transactions in the IV30300 table and you pointed me to the unposted table of IV10001 table – much appreciated! Hi Victoria, thank you for this resource. I am looking for field in Great Plains to add extra information about our stock items. What is the difference between the ITEMNMBR field and ITEMCODE field in IV00101? I am hoping that I can use the ITEMCODE field for the extra data. Otherwise, how would you recommend adding extra tags to my stock items? I am already using the Short Description, Generic Description and Class ID but I need at least one more field. I could also use the user defined fields in the internet information. Is this the best place to add the extra details? The answer to your question will depend on how you need to interact with the extra details you want to store. For example, how will the data be entered, do users need to change it or inquire on it inside GP, do you need to see it on GP reports, what size of data will you be storing, etc. While ITEMCODE does not seem to be used for anything, it’s only 15 characters and I am not sure if you can see it on any out-of-the-box GP windows. It will only be for reporting purposes. Users will not need to access the field via GP. Changes can be made through SQL if necessary. I couldn’t find the ITEMCODE field on any of the GP screens. In that case, if 15 characters is enough, I do not see any reason you cannot use the ITEMCODE field for this. Just keep an eye out for GP starting to use this field for something when applying service packs pr upgrading GP in the future. I used Modifier to add ITEMCODE to our Item Maintenance card and we use it to indicate maintenance levels. I just checked the GP2013 SDK and it doesn’t look like ItemCode is being used yet. Unfortunately the ITEMMAS.doc hasn’t been updated since 2007. Thanks for the assistance, Victoria and David. Any idea? how can we find when an item status was changed from Sales Inventory to discontinued? Out-of-the-box, without setting something up to specifically track it, there is no definitive way to find this. There is a Modified Date in the IV00101 (Item Master) table which will show the last date an item was modified, but there is no way to guarantee that the last modification was the change you’re looking for. I am new to your blog, but I have found a lot of useful information. I am currently trying to set up inventory cycle counts, but I am having a problem with the stock count entry. I have to many items to enter my cycle count manually. Is there anyway that you know of to enter the cycle counts quickly without having to use a third party software? Sorry, I am not aware of anything like that. What I’ve done before is export the items you want to count along with the current quantities on hand out to an Excel file. –Do your stock count and update a column in the Excel file with your actual count. –Then create a column for the difference between your GP QOH and actual count. –Sort the spreadsheet and get rid of the lines where the difference is zero. –From this, create a CSV file. –In GP, go to Tools>Integrate>Table Import. — Create a Table Import Definition for Inventory > Inventory Transactions Work using you calculated difference column for the TRX QTY Total. — Run the import then you’ll need to do a File Maintenance Check Links on Inventory Transactions Work to put it into a batch. — Find the Inventory Batch that Check Links created and post it. It’s been a few years since I’ve done this so I may have forgotten a few steps. But that’s it in a nutshell. It’s actually a pretty easy process. BE SURE TO TEST THIS OUT PREFERABLY IN A TEST COMPANY!!! Thanks for the advice David! I use a macro to fill in everything. I created a macro entering 1 line into the stock count, then I use Microsoft Word to mail merge each row I have in my stock count from an excel spreadsheet. Then I run the macro on the stock count entry screen. After you merge everything with this template, on the top 7 items take out the last line “scrollbyline”. On 8th item down on your excel list keep the line scrolling line in the merged macro. Last item will error out due to line scroll. I just enter manually. Check all zeros manually. Line row #’s should be 8 all the way down after item 8. The mail merge items I enter are: 1 (line number), WH, BIN, ITEM, 200 (qty). Sean – I was successful using the mail merge macro for the stock count schedule. My mail merge macro for the stock count entry screen keeps errorring out. Sometimes, the error message is that the window is not active. Other times it cannot write to the counted qty field. Could you provide me a copy of the macro that you used? Sean- I am also looking for mthis solution. Can you send it to me also? Hi Victoria, I have been following your blog and have always found it fantastic for us GP users. I was wondering if you could shed some light on a reporting issue I have stumbled across? I am trying to create a WIP report in SQL showing each contract and account number by posting date which I have done but I want to try and connect it back to the account period balances but I am using PaFeebillamount for each contract and that is not tying back to the correct figure for the total account amount. can you help shed any light on how I can do this? I have only done only limited reporting on PA tables, so I am not the best resource for this. I do know I have used the PAFeebillamount field to get the revenue, but without actually looking at the data and what you’re pulling in with your code, I cannot help with this, sorry. You could try posting your question on the GP Community Forum, perhaps someone there can help. No problem except I think I meant to say left inner. The radio button just below the standard join on crystal reports. I will double check and update in the office. I’m just on my iPhone right now. Multi bins data is stored in table IV00112. You cross that with IV00101 to get item description and with IV00102 to get site level details. Join IV00101 to IV00102 on the ITEMNMBR and IV00102 to IV00112 on ITEMNBR and LOCCODE (site). This will give you a list of only items that have a bin in 112 but if you want to include all items regardless of an associated bin that has been moved to or from inventory then you need to right outer join 102 and 112. Hope this helps. You also may need to filter out LOCCODE “”. Just look through your results to verify returned numbers don’t exceed actual as it will add an extra result for each item otherwise. I’m looking for a SQL query that will return the inventory items in each BIN. Another words it will list each BIN location and the item and quantities in that location. Any ideas? As aways, thank you very much for all your help! Unfortunately, I do not have multiple bins enabled anywhere on a test system where I can check this, but I thought this would all be in the IV00102 table. Have you ruled that out? Victoria, as a new user, your site has been very helpful in finding the needle in the haystack when trying to learn what was done when. One thing I havent found in the Inventory tables is a created by field to know what user created an item. Any ideas?? Thanks – have a blessed day. I am not familiar with the Price Trace Inquiry window – is it possible that this is a custom window or something added by a 3rd party product? If so, I would recommend asking the developer of this window your question. Thanks for a quick reply. I think Price Trace Inquiry window is not a custom window. I’m using GP9. It is located on the Inquiry tab menu bar then choose Inventory>>Extended Pricing>>Price Trace. Hope this helps you track it down. Many thanks Victoria. God bless. I appreciate that you are helping not only me, but many people. I stumbled across your blog, which was a great success for me–Thank You! My question is in regards to building a smarlist. I am trying to build one that shows an item number and the components of the BOM in relation. I’ve tried different BOM tables, but I cannot get one to show all components of one item number. Any help would be greatly appreciated! All you should need is the BM00111 table. Is there something specifically that is not working or that you have a question on? Huge fan of your book & site. I run a small business and implemented GP by myself with only the help of your book. Anyways, a lot of my prices have changed and I’m trying to mass update pricing (Currency Amount) for our inventory but am having trouble. Integration manager wont work with our setup because we are wholesale and have pricing breaks at different quantities, and Integration Manager through eConnect only works through “Insert”, no update. There’s GOT to be an easier way?! I have all the item #s, price level, quantity to/from, and price all in CSV file (just like how the IV00108 table is laid out, minus the DEX TS & ROW ID); but can’t figure out a way to import it into GP. I tried just updating IV00108 in SQL through a bulk insert from the CSV file but am getting errors (plus its probably not good habit). Maybe I’m writing the script wrong? Any ideas? Thanks! Thank you very much for the kind words, I am glad my blog and book have been able to help you with your GP implementation! My general advice is that I would be VERY careful about updating IV00108 (or any table, for that matter) directly in SQL unless you are 100% confident of the outcome. While I have done both inserts and updates to item pricing in the past for customers that required a lot of price changes, it always required testing and data validation and the code was written specifically for the situation. Unfortunately, there is nothing generic that I am aware of that will work for all possible price updates. If you have a lot of these changes to do (and especially if you feel this will be something you will need again in the future), perhaps this is something we can work on as a consulting project for you. Please let me know if you’re interested in talking about this option. Is it OK to delete records from IV00200? I was asked to clear the inventory quantities of some items, so I cleared the quantities in IV00112. Now, there are some items in IV00200 with a QtyType of 3. Can I just delete them from the table? Deleting records directly from a table is absolutely not ok unless you are 100% certain of the outcome. Without knowing more details of what is really needed, it is difficult to recommend a solution, but if you need to clear out inventory it is typically best to do it with an Inventory Adjustment transaction. The owner of our company, for whatever reason, has decided to devalue certain old items in our inventory. He wants the 2000+ of this item to all have a value of $0 in the Inventory subledger and for that to carry through to the GL. In effect, he wants to write off the value of that old stock while keeping the quantities. Is that as simple as running the adjust costs utility for this item and marking them as $0? And will that automatically post adjustments through to the GL? Yes, you can use the Adjust Costs Utility for this – it will create a GL transaction debiting the Inventory Offset account and crediting the Inventory account that is set up for each of your items. I would recommend performing a test in a test company prior to doing anything like this to make sure you are clear on exactly what will happen, what accounts will be used, what dates will be defaulted, etc. I love your site and use it as my main resource when building reports. Thank you so much for what I’ve been able to learn over the years just by referencing your site. I found an addition for the Source Indicator in IV10000 that I thought you might want to add. Twelve (12) is an In-Transit Inventory Transfer – something I discovered recently while trying to build a historical WIP report for manufacturing. Thanks again for your invaluable support of the Dynamics GP community. I added this source indicator value to the list – I appreciate the info. I’m attempting to import our inventory item listing through integration manager. We currently do not have any stock to speak of, and only 1 site. I try to specify that site for the QTYS/SITES destination in the integration, but it doesn’t seem to flow through into GP. I have a constant field for Site Display Options-Site ID, Site Location Code – CA, Default Site ID-CA, and default for everything else in that folder. Am i missing something? I need to add several hundred inventory items, and want to do via SQL. Can you point me to some procedure that covers the essential table relationships and required fields? Right now, I am thinking it enough to add records to the inventory master, price master, item-vendor master, and item quantity master. But, I’m sure I’m missing something. I do not have the complete list of tables for importing inventory items in SQL and that list may actually change depending on all the components and features of GP your company is using. Instead of importing directly into SQL tables, I would recommend using an import tool like Integration Manager to import new items. That way you can guarantee that you will update all the tables needed and will not break any of the GP application business rules/logic in the process. If that is not an option, you could look in the GP SDK to see if it has the information you need for an import like this. I agree with Victoria on that one. I have used it to load several thousand items into the system and it works well. Indeed, Integration services are not an option, unfortunately, but we have a pretty simple set up with only the most basic inventory modules, and don’t use extensions and serial numbers, bins, etc. I’ve done some research and had a discussion with our partner, so am plowing ahead. I’d be happy to share the outcome and procedure I come up with. Where best should I post it? Understood. 🙂 Thanks for offering to post the outcome and procedure – that would be great! I think this page is probably the best place for it. Okay…making progress but have run into a slight snag on the pricing (just standard item by item pricing–not using extended). I have all the data in the right place for the unit of measures and price tables, but here’s the problem When I put the default Selling U of M in the Item Master record for the item, the pricing on the Sales Order Form doesn’t calculate upon entering the quantity; the price and amount just stay at 0, as if the form can’t find the qty/pricing schedule. Now, I can get it to work if 1) I null the IV00101. SellingUofM field, or 2) if I change the unit measure in the pricing list detail window–even just changing an upper case to a lower case letter. So, I figure that there’s some “after update” event on the detail price list u of m field that’s linking some piece of data somewhere. Follow all that? I never get any error messages about a disconnect between the default and the detail U of M, which happens if it can’t find the detail line U of M or if the default has nothing in the schedule detail corresponding. One more twist is that the hierarchical tree on the bottom left of the Item Price List window (which has the UofM schedules as top nodes and UofM details as subnodes) does not contain up to date information on the UofM/price/qty as they exist in the Item Price List table (IV00108). For instance, it will have a unit of measure that’s not even listed. But, again when I force an update by changing a u of m detail field, the tree/nodes suddenly refresh with the correct data, and from then on, the pricing calcs on the SOP entry form work just great. So, questions arise: Where is the tree on the price list window get it’s data from? It’s not IV40402 since it doesn’t correspond exactly until I force the refresh. But where else could it be? I think the form is “syncing” the tree’s data source with IV40402, and that somehow affects the SOP entry form as well. Perhaps if I can track down this data source, I can update it via SQL and all will be peachy keen. Are you only importing the pricing into IV00108? What about IV00107? And are you also importing a default price level for the items into IV00101? Finally, are you running check links after your import? If not, this might not be a bad idea…it would let you know if something was wrong and/or possibly fix some of the missing needed links. I had somehow overlooked IV00107, which apparently stores all the price-level/UofM combinations for an item. And that’s exactly where that tree-view control in the Price List Maint. window gets it’s information. You can import all sorts of pricing/UofM structures into IV00108 and put the default price level into IV00101, but until IV00107 is updated with the price-levels/UofM’s pairs, that tree-view control won’t reflect what you’re looking at in the Price List Maintenance Window, and sales transactions won’t calculate the default pricing. Anyway, I did successfully update all the pricing, (doing some major overhaul of IV108 and 107) and it works just fine in the SOP and POP transactions. Also, for a couple of hundred new items, I was able to import all the product and vendor information our admin staff usually has to enter in six different windows with just a few SQL statements. I did document the procedure I used, and as soon as I tidy it up, I’d be happy to share. But my full document, for my own records, will be a couple of pages (for when I look again at this next year and don’t remember a thing!). So, again, not sure where to post it. Thanks again for your help and wonderful site. Thank you for your response to this string and Victoria for this blog. I was unaware of the Price list utility. We’re in the process of changing our price method from % of Standard Cost to % of Current Cost. Not only does this change delete the Price levels, we saw no way to do the price method change in bulk. This utility will save us hours of doing them one at a time. Plus it will update BOTH our price method and Price levels (Which we needed to do also) in bulk. A question has come up on how to eliminate currencies that we no longer use in our price lists. I could easy enough rip them out via SQL delete of records from IV00107 and IV00108 then run Checklinks, but I don’t know if that is the smartest way to do it. Is there an in applicaiton way to remove price lists from items in mass? From a query against the non US$ price lists that are targeted, I have 2608 entries in each table to eliminate. You might look into Price List Utilities. I’ve used it to get rid of un-needed Price Levels. Thanks David. I am using it in my test environment now and seems to be exactly what I need. Much appreciated. Thank you very much for this suggestion! Hi, first of all congratulate Victoria for your great site, what do you think is the problem that do not fit even reconciling inventory quantities? as the first movement does not fit against the balance .. and reconciled ‘n’ sometimes not solve the problem, check links of tables nor gp utilities .. no longer could be causing this situation, apologize for my English .. hoping I can target in this regard .. thanks and regards. I am sorry, I am not sure what you mean. If you are having trouble reconciling inventory, consider getting a product like The Closer to help with this. I am in the process of getting familiar with GP 2010 via the 90-day trial version and using both the Sample company as a reference and concurrently setting up new company so that I can go through the process. But I cannot get the List Price to appear as Enabled (not grayed-out) in the Inventory Item card within the new company. That new company is not set up as Multi-currency (or at least I don’t think it is), but the Sample company is. Does having one company set up within the Client as MC somehow force the second company into the same condition? If not, then where would I go to confirm that the new company has not somehow ‘inherited’ a MC setting? If Multicurrency (MC) is enabled, it’s for an entire installation. However, I don’t believe MC settings should have any impact on whether or not you’re able to enter pricing for items. Are you sure you didn’t enable Extended Pricing? If you did, you may not be able to use the ‘regular’ pricing. Are you following any kind of guide and/or getting any help on setting up your new company? Within both the MC company and the new company I can enter a Standard and a Current COST. But traditionally COST is a reflection of what the company to had to pay to purchase/acquire/manufacture/etc. the item, not what we intend to sell it for to the customers. But I cannot enter a List PRICE in either of the companies. My other investigation on the web has indicated that this is due to the companies being configured as Multi-Currency. I have no idea why that should be a rule to eliminate entering List PRICE, but that is what I found. Since installation of the Sample Company (‘Fabrikam Inc’) forces a MC company into the Client, it must somehow be affecting the new company which I have set up with only US-$ via Multicurrency Access. And I cannot Delete the other currencies from the system via Currency as long as the Sample company is using them. Since I want to set up my various Item Pricings as a % of List Price the in-ability to enter that List PRICE is a problem that I need to eliminate. Thanks for the more detailed explanation, I now understand the real question. 🙂 When you are on the Item Maintenance window, click the little GoTo button in the upper right corner and choose Item Currency. Select your Currency ID and enter the List Price. This List Price will be used for all pricing you enter for the selected currency. Even if you’re not using Multicurrency, this is fine and will work with no issues. You can theoretically turn off Multicurrency, but that might break other stuff that may have been set up, and this is a little more difficult to answer without looking at other settings. So I would just leave it for now, especially since this is a test, right? I followed your suggestion and entered the List Price value – thank you. However when I went back to the Item Maintenance ‘card’ the List Price was still grayed-out and the card’s text box was still empty – it did not reflect the entry I had made so that it could be visually reviewed for accuracy. If indeed the process succeeded in entering a List Price, why does it not appear in the Item Maintenance card for the item itself? Our fiscal year is about to end and we need to close each module. The problem now is our server as of now have two companies running in two databases. Is it advisable to simultaneously perform the closing of modules? You mean closing the same module in two different companies at the same time? This is very difficult to answer without having a lot more information, like the size of your data, the resources available on your server and network, etc. However, in general, if there are enough resources, there should be no issue with running the year-end process in two companies at the same time. How to findout total stock of kit item ? A kit is not a real item…it is a like a virtual grouping of items. Thus you will never have a kit in stock and it will never have quantities. Thanks for sharing your extensive knowledge! I have been trying to figure out what sets the primary vendor on an item. We often buy from different vendors and sometimes our data shows two primary vendors and no secondary vendors. But other times, we might have no primary vendor but multiple secondary. I am equating a value of “1” in IV00103.ITMVNDTY as “primary” and a value of “2” as secondary vendor. In GP, an item can (optionally) have one primary vendor per site. So it is possible to have as many primary vendors as site for an item. In gP you can see this on the Item Quantities Maintenance window (Cards | Inventory | Quantities/Sites). In SQL table IV00102 will store the primary vendor per site in the PRIMVNDR field. When you create vendors for each item, by default they will at first be set up with a value of 2, meaning they are not the primary vendor. If you then go to the Item Quantities Maintenance window, you can select a primary vendor for each site for that item, and that will change the value to 1 in the IV00103 table and also add the primary vendor ID to the IV00102 table. Hope that helps. Thanks so much. That’s exactly what I wanted to know! Can we not do it through integration manager? The GP 9.0 (Yes we’re upgrading to 2010 very soon) documentation indicates that changing the price method (we’re using standard pricing) is not something that can be rolled down to an item class. Have you come across anyway to get around this without having to change each item one at a time. I have not done this myself, so I do not know if it would work without testing it, but you could possibly accomplish this directly in SQL… How complicated this is would greatly depend on the exact type of change you’re making as well as the current pricing you have in place. No matter what, it will require a very good understanding of the tables involved and a lot of testing, so would only make sense if you are going this for a large number of items. Mark, can you specifically tell me from what and two what you are going? I have done quite a bit here. Also do you have integration manager? It appears that we do not have Integration Manager. If I go to Tools – Integrate – Integration Manager, it is greyed out. Not sure how to get Integration Manager or how much it costs. I suppose I’ll follow up with our GP Partner. What we need to do is very simple. We have about 40 Item Classes representing about 4000 to 5000 inventory items. We simply want to change each Item Class’ Price Method from % Markup – Standard Cost to % Markup – Current Cost and have it roll down to all the items. We just wanted to avoid changing each of the 5000 items one at a time. when we tried to post purchase receipt on dropship order, we got this error msg and i can’t figure out why. Do you have any idea on how to fix this? i checked item setup and all look fine. I have not come across this message before in GP. Do you by any chance have any customizations or 3rd party products that might be requiring some additional setup to be present? If not, then I would recommend posting your question on the GP Community Forum to check if others have seen this error. This late was a HUGE help. Very nice Victoria! Can you tell me what PSTGSTUS (Posting Status) of 35 in table IV10000 means? The SDK only shows possible values of 0, 1, 2 or 3 for the Posting Status. Are these transactions being imported? What is the batch status for the batch in the SY00500 table? can you tell mw what this field is for ITEMCODE [Item Code] (AK6) char(15) in IV00101 and if it is accesable to put data in. there is nothing in the field and someone here wants to use it for some kind of classification. There is nothing in the SDK about that field, and I do not see data in that field in a few installations that I have checked, so it is most likely reserved for something that is either not in place yet or there for integration with a module that is not too common. However, I also do not see a way to enter anything in there via the GP User Interface. We are running GP2010 and using the In-Transit Transfer functionality. I have a transfer that has been shipped and showing a status of Received but the transaction has not moved to history. I have run checklinks on IV and it did nothing. I have also checked the document header and line status in SVC00700 and SVC00701, all of which are 6. Any suggestions on how I get this “completed” document to history? I have not run into this before, have you confirmed that the transaction has posted? If so, I would try running Inventory Reconcile. Thanks for the reply. The document has definately posted. I was hoping to avoid Reconcile as it runs for 5 hours and this is a 24hr business but what must be must be. I hear you. 😦 Unfortunately, there is no way to tell if Reconcile will fix this, either. If you have a test company where you could restore your live data and test this, you might want to do that first…so that you don’t waste all that time on the live company. We are having this happen to all of our In-Transit Transfers now. At some time it did move to history and then stopped. Reconcile has not helped resolve this. Any other ideas? Thanks!! Has there been a solution for this problem, I am running GP 2013 and am Running into this currently. Any Idea of whats going on? Thanks for such a great resource. We currently have an invoice that completed without allocating the serial numbers on the order. Now we have a large qty of serials that are available to be picked by another user but should be on an existing order. Is there anything you would suggest to secure these serials to the correct order? Sorry, I have not run into this situation before. I would recommend posting your question on the GP Community Forum to see if anyone else has encountered it before. Otherwise, you might want to ask GP Support to help resolve this. Thanks for catching that, it has been fixed. What table and field would I find the default price level for each item . I need to set all the default prices to our Retail/Internet price level for all items. That is PRCLEVEL in IV00101. Be careful with this – if you assign a price level that is not assigned to the item, SQL will let you do it, but you might get errors in GP. Thanks Victoria for the warning. I will be using your AWSOME view_Inventory_Price_Levels view to make sure that the items i am updating indeed are in that price level. Thanks again for the resuce!! Hi Victoria – I’m a first time poster, thanks for providing such a comprehensive resource! I am trying to gather data via ODBC regarding inventory transactions and the only thing I cannot find is the “offset account” that inventory is signed out against. Can you tell me what table that lives in? I am getting the rest of my transaction data from IV30300. Thanks! It sounds like you want the IVIVOFIX column – you will need to link that to the ACTINDX in either GL00100 or GL00105 to get the account name/number. Please let me know if that’s not what you’re looking for. Jackpot! Thanks very much, that’ll do it!! I was wondering if there was a script that i can run to remove items from a price level. We are trying to remove a couple of price levels from the system but there are items associated with it. Like 2800 of them. To pull up each and everyone would take too long. I am not aware of a generic existing script to do this, sorry. I know I have done something similar in the past for a customer, but I am not comfortable giving anyone scripts to delete data without being able to see their data first and test on it. Hi Victoria, thanks a lot for all informations. Is there any table for Deleted items in GP either for each module or together? Out-of-the-box GP does not store any deleted information. Is this a custom table? I am not familiar with a table called ivitemcurr. If so, the issue may be SQL permissions on the table or it may be something specific to the customization that this table is part of. Thanks for your reply. The problem was happening due to a tracking software installed by our Microsoft partner to track a Item Master table related issue. I’m a first-time poster, so first, thanks for all the information you’ve compiled here; it has been very helpful for me a number of times. I didn’t see this one listed anywhere, but there’s another field that I think could be useful to include. I’ve used the field PCHSRCTY from table IV10200 a few times to identify the type of transaction. I’ve listed the different values from the GP Resource Descriptions. Feel free to incorporate this if you feel it could be useful. Thank you very much! I have added these to the page above. We are doing a physical inventory today. We have set up our count schedules in GP with all the items. Can i import our counts directly into IV10301 then process through GP? I have not done this, so I am not sure if this will work or not, or what the dangers might be…sorry. One thing I do know is that if you are using lot or serial number, that is in a separate table. If you decide to go ahead and do this, please post back to let me know how it went. This went well. We are not doing lots or serials numbers so updating tha IV10301 table then procrssing the count through GP worked like a charm. Excellent, thanks for the follow up and I am glad that it worked for you! Hi Victoria- I am trying to learn more about the above post. I have 10,000+ non serialized parts that need to be counted. The real issue and bottleneck is inputting all of them into GP. A upload would be helpful. Since this mpost, have you gotten more information on how to mdo this? No, sorry, I do not have any more information on this. I don’t think you can easily track inventory costs and quantities and have it not hit the GL completely. However, you should be able to set this up so it hits a different set of accounts than you normally use for ‘regular’ inventory. For example, if the only issue is the COGS account being hit, why not create a separate COGS account for these items, or even use a Marketing Expense account? I would think that would be preferable, as that would actually expense the cost of these items to the correct place. Depending on how you are set up to use SOP (using accounts from the items or customers), you can change the COGS account either on the items or the customers (I imagine you have a ‘dummy’ or special customer ID use use to process these through SOP). Hope that helps. Thank you very much for the response, unfortunately the CFO doesn’t really want to create accounts to hold these false COGS amounts. They are expensed items. Is there anyway to automatically override the cost amount to 0 at invoice generation? We need the costs on the item master for POs but right now, that means that the invoicing clerk needs to remember to 0 the distribution for COGS and she does not normally even look at the distributions. I don’t think that you can do what you are asking for without a customization. It’s a catch 22 – you cannot track quantities and costs for purchasing without also having inventory and COGS distributions. However, why not just set up the inventory account to be the same as the COGS account? The GL entry will still be created, but with a net result of zero. Your avatar is pretty angry looking! 🙂 The avatar is automatically created by the blog software for anyone who does not have one. If you click on it, I believe it will take you to a website where you can set up your own. We recently migrated to GP2010. It appears that during the migration, possibly in the loading of inventory, we got some items that have quantities without purchase receipts in the system. One in particular shows about 300 items onhand. The problem is that the stock status and purchase receipts reports are showing negative valuations. We are getting records on the purchase receipt report that shows a vendor id of “Sales Entry” and a receipt type of “Override”. The unit cost is correct but the extended cost shows $0 and we then get a negative value remaining. A query of POP10500 shows no receipts with unsold quantities for that item number despite the 300+ onhand. I am very comfortable with SQL updates if that is the only way to correct this. At this point, I would recommend talking to GP Support or your GP Partner so they can help you figure out what exactly happened and suggest the best fix for you. Sorry not to have an easy answer. First off all thanks for compiling such a great info blog of GP tables and making our life little easy. My question is what join I should have between GL20000 and IV30300 for all type of transactions i.e. Sales, Receiving, IV adjustments in order to get the Total Cost posted to IV Accounts for a particular period. Currently what I am using is “GL.ORTRXSRC = IV.TRXSORCE AND GL.ORDOCNUM = IV.DOCNUMBR”, but it seems that this join is not giving me Same total for SUM(IV.EXTDCOST * SIGN(IV.TRXQTY)) compare to SUM(IV.EXTDCOST * SIGN(IV.TRXQTY)). The amount of work and complexity to do this yourself in SQL is going to be crazy. I would recommend at looking a product that already does this, like The Closer. I had feelings that it will be complex to get the ledger & sub-ledger comparison. The product “The Close” you recommended is good but due to budget constraints, is not a feasible solution. I will try dig more deeper into that. I am needing to do a cost comparison of intercompany and third party vendors. As such, the factory has given us a price sheet from which I can get their costs. I would like however to have a place I can place that against the vendor so that 1. that cost is available for reporting and 2. that cost will be used anytime we order from the intecompany vendor. For now, I am going to split the report between accessing an access database and the GP database but would prefer for performance reasons for all of it to be in the GP server for part 2 of my “likes”. Any suggestions? I was wondering about updating the IV00103.LastOriginatingCost for the specific vendor but I am not sure if that would stick or be safe. As far as keeping the data on the SQL Server, why not just create your own table that hold the data inside either DYNAMICS or your company database(s)? For the cost to be automatically correct in GP…I don’t believe you can simply update the Last Originating Cost once – as you suspect, it will not ‘stick’, it will be overwritten every time a receipt of an item is posted. So you either need to keep updating it constantly or come up with some other customization for this. We posted an inventory adjustment on the fly. Something happend when posting and it did not go through. However, I went to create a new transaction and put it in a batch as my user ID. I did an edit list and saw that rogue transaction in there. I tried pulling it up in transaction entry but it said it was posted. I looked at my detail and it wasn’t. I posted the batch anyway and only my second transaction posted. I tried running a checklinks on the transaction work files and it updated the batch….so it says. Tried posting the batch again, but it just stays there. Any ideas? Thanks in advance! If I am understanding what you are describing correctly, there is no simple fix for this and certainly nothing that I would be able to recommend without actually looking at your data. Your best bet will probably be to work with either your GP partner or GP support to help you fix this. Dear Victoria how I can roolback(reverse a posted transfer batch). I am not aware of any way to “roll back” anything posted in GP. Unless you’re talking about a SQL Server point in time restore, which would also wipe out any other changes made and is not an option in most cases. Typically, to reverse a transfer you would enter a transfer going the opposite way. So if you originally transferred Qty 3 of Item A from SiteA to SiteB, you would enter a transfer of Qty 3 of Item A from SiteB to SiteA. IV30300 table and IV10201 table not got updated for some sales documents. I have verified the item information, Maintain Transaction History Marked in IV Maintenance option Screen. And The Sales transaction were not a Dropship transactions. Please let me know for which scenarios the IV30300 and IV10201 tables not got updated ? I would recommend talking to GP Support to get a more definitive answer on this. Hi Victoria, I tried but could not find any option to install GP SDK from the GP 10.0 installation media. Is it available in GP 10.0? Yes it is. For GP 10.0 it is in the Tools folder under SDK. Look for the SDK.msi file. Thank you so much for such a valuable information. Is there anywhere i get get a listing of Fileds Defs for GP specifically the IV00101 table. DECPLCUR doesnt tell me mucha as to what data that is. I need to have the field defs for all the fields for a project I am doing for sales. They are claiming GP does not hold all the data they need. GP SDK – this can be installed from the GP installation media. Support Debugging Tool – I have a few posts on it that might be helpful. The DECPLCUR field stores a code for the number of decimal places to use for the currency amounts on the item. If you are using multicurrency, there will be a number of decimal places for each item/currency combination in IV00105. It is important to note that the code stored in DECPLCUR is not the actual number of decimal places, which will be the code minus 1. So if DECPLCUR = 3, that is 2 decimal places. Once again you save us mere mortals in a time of need!!!! Hope you can help me in this. i bill an item, but could not be able to bill because it said that the item still alocated. i insert the Item number and it maked check on aloc. is ther a away i can uncheck that? i do verified the PO and its received already. You’re on an inquiry window, so you cannot “uncheck” allocation there, it is informational only. An item will show that it is allocated when it is fulfilled on an order – you can find what order or invoice it is fulfilled on by going to Inquiry | Inventory | Serial/Lot Trace. Once you find the order or invoice it’s allocated on, if this is not correct, you can open that sales transactions and remove the serial number from it…that will “un-fulfill” it, so you need to be 100% sure this is what you want to do. Hi Victoria, is it possible to change the settings in GP so that the Go To action from an Inquiry window opens the required Inquiry window instead of Maintenance window. Currently, for example, when a user click Go To>Price List from Item Inquiry, the GP opens the Item Price List Maintenance instead of Item Price List Inquiry. We are using GP 10. This is not possible out-of-the-box in GP. I do not know how easy it would be to customize this, you would need to talk to a developer or GP Support to find out. I wrote a VBA mod that does this. What I did was modify the Item Inquiry window to include some of the fields that are on Item Maintenance but missing on the Inquiry window. Then used VBA to redirect the Item Inquiry to the PriceList Inquiry window. So basically what happens is anywhere the Item Maintenance gets called – for example in Sales Transaction Entry – the Item Inquiry opens up instead. Only the users that NEED to access the Item Maintenance card get access to it. I can send you the package if you want it. I have problem in Inventory module “The serial number and extended quantity for this item do not balance”. Is this when posting in SOP? If so, take a look at KB article 938693. Sorry, I don’t understand. During entry time of what? What about system shutdown? Thank you so much for your prompt reply. Is it safe to add triggers to GP tables? In addition, I will appreciate if you can suggest some monitoring tools for these types of situations. Yes, triggers are safe to add if it is done right. 🙂 This is not really my area of expertise, I would recommend asking on a SQL Server forum, or at least one of the public GP forums to see if you can get some more advice on how to best monitor this stuff. In last 5 months, it has happened to 6 items. Any idea what may be happening? When we checked these items in IV00105, we find DECPLCUR equal to 6 for these items whereas for all other items it was 3. We are using GP 10 and SQL 2008 R2. In all my years of working with GP and all the customer installations I have seen, I have never seen GP do this and I would be very surprised if GP itself is causing this. I would suspect some other process – a customization, another product, an import gone astray, a SQL job – to be causing this. Unfortunately, it’s impossible to tell you with any certainty what is causing this, since of course, it should not be happening. I would start by examining everything you have that touches GP data to see if you can determine what is causing this. If it’s not obvious, you may need to put some triggers on tables or some other monitoring tools in place to track this down. I am trying to build a report where I need the Receipt No. And Vendor Doc. No. along with some other info for Inventory Transaction Document Types = 4 (Purchase Receipt). I am able to get all the info except Vendor Doc. No. from IV30300. I will be thankful if you can advise me from which table to get the Vendor Doc. No. corresponding to the Receipt No. Thank you so much for you quick and effective help. hope you be fine .I appreciate your work providing help to people. please provide me some solution. as there any sql query to solve this problem. Sorry, this is not something I would feel comfortable simply giving someone a SQL script for without seeing the data. I would recommend asking your GP Partner or GP Support for help with this to make sure that you do not compromise the integrity of your data. I am setting up beginning balances for GP 2010 now, and i am kind a stuck when uploading inventory balances. For your information, each of our item in inventory has lot number and expiration date. I am wondering of how can i upload expiry date since the Inventory Transaction template on Integration Manager seems doesn’t have any field which enable us to do so? I have tried by putting the expiry date information under Date 1 and Date 2 in the lot number attributes, but that doesn’t give me the correct result. I don’t work with lots too often, so I have not tried using IM to import expiration dates for them. Looking at it briefly, I don’t really see a way to do this in IM, so your only option may be to either enter them manually or directly in SQL Server. I believe that is in the IV00300 table. Thank you so much FAC and Victoria. My apologies for assuming that FAC is some sort of Code name for Victoria. Thank you so much for such a quick and effective reply. Yes, it helped me a lot and now I have completed the report with all the required fields. You do not have permission to view this directory or page using the credentials you supplied. If you have reached this page in error, please contact voice@microsoft.com for assistance with your account. If you are a GP customer, you will need to ask your partner to get the Support Debugging Tool for you. Can you help me to creat a view finding item (quantity+cost) in a specific date? Are you looking for a historical stock status? If so, I do not have any code I can share for that. Ok, Which table/s are used for “Item Trx Inquiry” Window? I think with some filtering ~ Criteria ..we can find what we are looking for. I would recommend that you install the Support Debugging Tool to determine what tables are associated with what windows. Here is a link to a blog post on how to do this: https://victoriayudin.com/2010/05/17/support-debugging-tool-new-build-released/. Now we’re using GP portal to input demand of stuff or goods (Purchase request), and every demand processed to be Purchase Order, it using default currency ($US) for each item code. If you have Integration Manager you could try importing all the item currencies you need. We use the Copy Item function quite a bit but there’s a problem with it – the new-from-copy item retains the Date Created value from the original item. Is there some way to force it to use the actual date it was created?